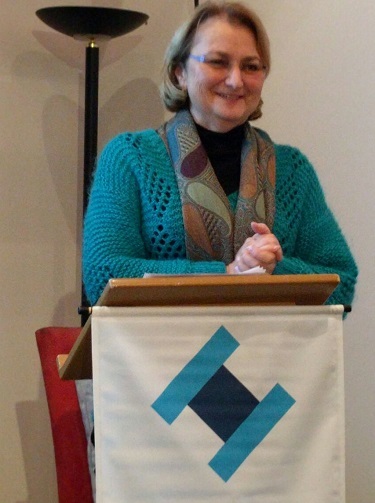 After a business meeting that outlined the successes of the past year and laid plans for the future (including a fundraising walk scheduled for 13th November 2016), the audience of 35 members attending the Hadassah New Zealand Annual General Meeting (AGM) were privileged to hear Naomi Meltzer talk about the treatment of Low Vision at Hadassah. In September Naomi Meltzer, recipient of the Valda Knight Memorial Scholarship awarded by the NZ branch of Hadassah International to assist a NZ medical professional to study their particular area of interest at Hadassah Hospital in Jerusalem, set out to study low vision services in Israel. Coming from NZ to Hadassah Hospital in Jerusalem in September last year, I imagined armed guards at every entrance searching bags, checking ID, questioning me….The security was a non-event, finding the entrance was. When you are looking for the second floor, Main Building and the bus drops you at a point where there is no clearly defined gate let alone main building, this presents quite a challenge. Hadassah Hospital is a huge campus on the outskirts of Jerusalem. The Michaelson Institute is essentially a hospital based multi-disciplinary low vision clinic. It is staffed by Ophthalmologists, Low Vision Optometrists, a social worker, a genetic counsellor and a very experienced rehabilitation instructor. Hadassah is a teaching hospital and all medical students, particularly Ophthalmology registrars attend a lecture on low vision as part of their course. The clinics are conducted in a mixture of Hebrew, Arabic and English. Fortunately instead of letter charts they use number charts and I was able to learn my numbers in Hebrew very quickly this way. 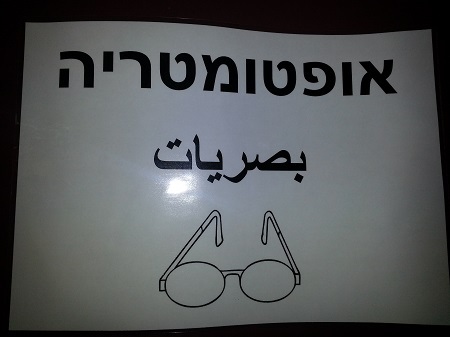 Israel, though not a wealthy country, has a social welfare scheme for people with low vision and blindness which is based on need, both visual and financial. Those with very severe loss (less than 6/120) receive a social welfare benefit much like our Disability Benefit. However those with low vision between 6/12 and 6/120 or less than 20 degrees visual fields including homonymous hemianopia, receive a means tested subsidy from the government which pays for between 50% and 90% of consulting fees and cost of low vision devices, depending on their income. The Israeli technology that I was keen to find out more about is the Orcam glasses for those with really significant loss of vision. This is a head mounted device which is worn with a transmitter strapped to a belt or carried in a bag and a small attachment worn on a finger. The device recognises objects through a smart camera and speaks through a mini earpiece. It is activated by pointing at a text/product or by pushing a button while looking at the text/product/face direction. These two options ensures that even a blind person will be able to operate it – that is according to the sales team, although they add that it is not suitable for everyone and requires training. They also concede that the better the vision the easier it is to learn to use it, which correlates with the advice of colleagues at Hadassah, who pointed out that if you have sufficient vision to use it you would usually use other cheaper and more readily available technology.